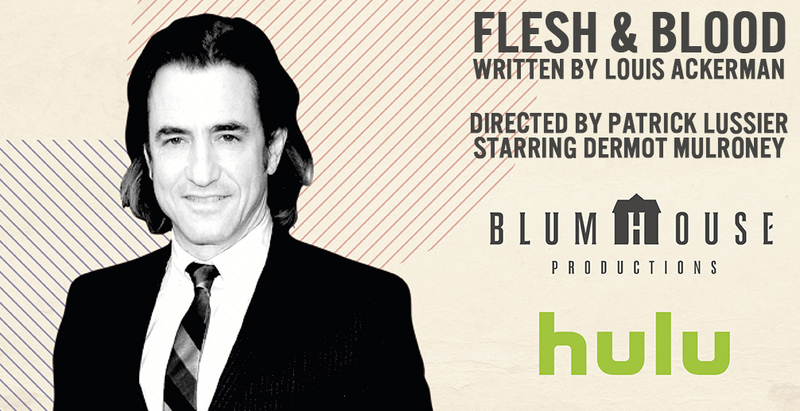 We are proud to have set up Louis Ackerman’s horror/thriller script, Flesh & Blood with Blumhouse Productions. The film will be part of Hulu’s ‘Into the Dark’ series, and be released in Nov 2018. Dermot Mulroney (Burn After Reading, Stoker) will star as the doting father trying to help his daughter, Kimberly, a teenager suffering from agoraphobia who has not left the house since her mother’s still-unsolved murder. Patrick Lussier (My Bloody Valentine, Drive Angry) is directing. Louis was our 2015 Feature Grand Prize Winner. We speak with him below. What gave you the inspiration to write Flesh & Blood? It’s a little ironic actually. I wrote the script several years ago out of frustration that I wasn’t getting any of my other scripts optioned/produced. The idea was to write a one location-set thriller that, if all else failed, I could produce independently on a low budget. And lo and behold, this is now the first script of mine to actually get made, in Hollywood no less. ‘Life Expectancy’ and ‘Flesh & Blood’ are both disturbing stories, what is it that attracts you to this form of screenwriting, and was this something that you have always been interested in as a writer? I love stories that tap into the dark side of the human experience. Those are the kind of films that I like to watch and those are the kind of stories that I like to write. It’s strange because I am not at all a self-serious or nihilistic type of guy but there is something about the doom and gloom of horror/thriller genre storytelling that I find compelling. I don’t think I’ll be writing a romantic comedy anytime soon. Out of all the screenplays you have written, did you feel Flesh & Blood was most likely to be the first one produced? I always thought it was a script that could get produced at some point; I just never predicted it would be the first. 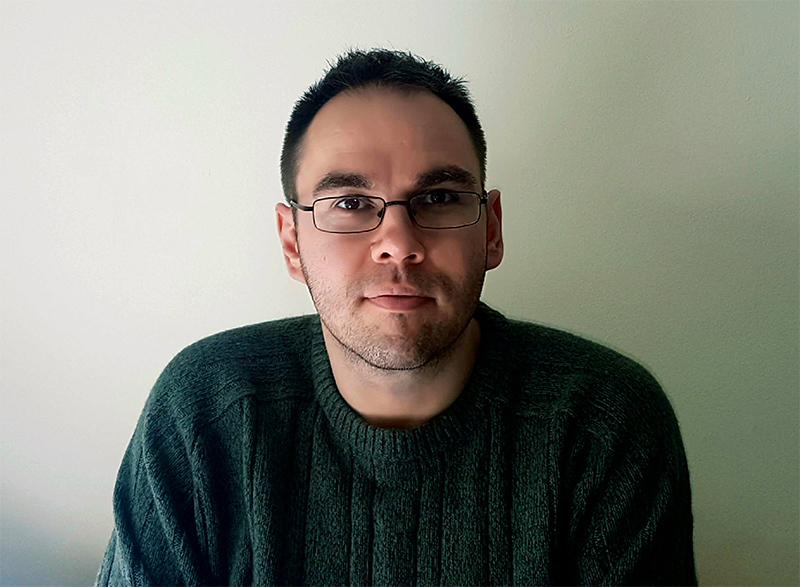 What’s it like to now be a produced screenwriter, and can you give us a bit of an insight into the trials and tribulations that all screenwriters face in order to get to this point. For an aspiring screenwriter, getting your work read by producers/production companies is good; getting optioned and paid is even better; but to actually have your work produced? That’s the holy grail. When I was 16, I had dreams of being in Hollywood by the time I was 21. I am now 32 years old. That might give you an idea of how long the journey has been to get to this point. If you want a career in screenwriting — any creative writing for that matter — you need a lot of patience and a lot of resilience. You have to be prepared for the long haul, but that can actually help people become better writers because, in that time, you can build up life experience, hone your craft, find your voice as a storyteller, and learn how the business works. It’s all a trial by fire of course, but it quite often sorts committed writers from the hobbyists. How did it work with Shore and Eugene Rhee getting your screenplay out there? Were you kept up to date along each step of the journey? After some early discussions together regarding ‘Flesh & Blood’, I signed a shopping agreement with them, which essentially gives producers the right to ‘shop’ your screenplay around to prospective financiers/production companies for a fixed period of time. They already had some ideas about where they wanted to take the script and I just let them do their thing. It was a remarkably quick and painless process. Within a few months they came back with two potential avenues, one of those avenues led directly to Blumhouse’s doorstep, and that was a no-brainer for me. And yes, we’ve stayed in contact throughout the process. How did you feel when Patrick Lussier was interested in directing the project? Patrick’s attachment to the script helped to legitimize things. He’s got a really good track record in the industry and Blumhouse wanted to work with him, so his involvement was really the key to launching the ship. There were two companies interested in your screenplay. What made you want to go with Blumhouse? Getting a horror screenplay into the hands of Blumhouse has been on my screenwriting bucket list for some years now. So, imagine my surprise that I can now cross that (fairly unlikely and specific) goal off my list? Can you talk a little bit about the stages from the point Blumhouse were interested, to going into production? This is one thing no one ever teaches you about becoming a screenwriter. There is so much to negotiate and agree upon. Firstly, everyone needs to agree on money, which is the bottom line. In a screenwriter’s case, that means settling on a figure for the option and purchase prices, and whether or not there will be any profit participation (i.e. money from the backend). An agency representing myself, the producers and the director dealt with the negotiation on our behalf. The terms were agreed to on good faith and, while the contracts were worked up, we entered into a state of pre-production. Screenwriters traditionally sit out this part as, unless rewrites are required, or the writer is also producing and/or directing, there isn’t much you can contribute beyond the script itself. You initially set Flesh & Blood in the UK. Were you concerned over any changes that needed to be made to set it in LA? The American vernacular isn’t all that different from ours in the UK so there was really very little that changed. Only a cosmetic rewrite was required to adjust the minor differences in language. I’d say 95% of what I originally wrote remained pretty much the same, with only a couple of additional scenes added and some dialogue tweaked here and there. This is now going to be part of Hulu’s Into The Dark anthology series – released 2nd Nov 2018. What did you initially think when the idea of going from a standalone feature to it being part of a TV Horror anthology was pitched to you? Did the script need to change because of this? The idea of ‘Flesh & Blood’ becoming part of a larger tapestry was genuinely thrilling to me. TV is the go-to medium these days for all the best stories and I loved the idea of a horror anthology event series, particularly because each episode would in fact be a feature length standalone film. It means that, as a film, it will be accessible to a larger audience and therefore it will be seen by more people. The series has a holiday-based theme, so every episode will be set during an American holiday. As a result of that, perhaps the single biggest change to my original script was the addition of an opening scene set at Thanksgiving to reflect the anthology’s thematic device. What is the key lesson you have learned now that you have become a produced screenwriter, and how can emerging writers better prepare themselves to make this transition? I have learnt a lot in this past year as this project came together, particularly about the business side of screenwriting/filmmaking. The key lesson: be prepared. And I would advise any aspiring writers to really consider what might happen if they made a script sale. Do the research on what you could/should expect to get paid and the stages of payment; research the benefits of self-employment versus going limited; consider if you would need a business bank account and/or an accountant; and familiarise yourself with tax processes and what you should expect to pay so you can manage your money responsibly. I think, when you’re an aspiring screenwriter, you’re so preoccupied with “making it someday” and enjoying the creative side of the work that you never really consider or think about the business side, and all the practicalities and responsibilities that come with it. What’s next for you? Any plans to come out to LA anytime soon? Yes, I plan to come out to LA sometime this year to meet some people and lay some groundwork for future projects. I have another horror screenplay I am looking to get out there, with more projects to follow.